Based on the classic Bowie, the SOG AU-02 Aura Hunting knife is a revolutionary approach to hunting knives, featuring a range of innovative features aimed at the outdoorsman. The unique blade has a clip-point for piercing power and fine control. The long, plain cutting edge guarantees efficient slicing and includes a built-in gut hook. Instead of a bulky crossguard, the Aura builds finger safety into the blade design itself. The handle is made from lightweight glass-reinforced polymer, overlaid with rubber for a secure grip. The handle also contains a convenient sharpening tool. Simply unscrew it from the back when you need to do some field maintenance. 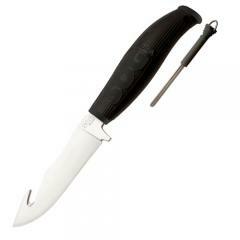 The knife comes with a wear-resistant nylon sheath to protect the blade.